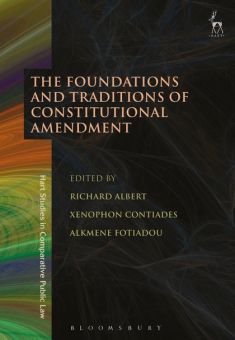 Richard Albert tells us about the new edited collection, The Foundations and Traditions of Constitutional Amendment, co-edited by Richard Albert, Xenophon Contiades, and Alkmene Fotiadou (Hart, 2017). We asked Richard Albert about the book. The seeds for this volume were planted in July 2014, when Xenophon, Alkmene and I were exchanging emails about our mutual scholarly interest in constitutional amendment. It had become apparent to us that we were witnessing the birth of the field of comparative constitutional amendment. We had been longing for a forum to workshop our papers with colleagues in the field, and so we decided to convene a roundtable on comparative constitutional amendment in Chestnut Hill at Boston College, where I serve on the law faculty. Our Workshop on Comparative Constitutional Amendment was held on May 15, 2015. We spent the entire day discussing and critiquing papers prepared specifically for the Workshop, and we continued our conversation over a dinner that stretched deep into the night. We were hosted with great warmth and generosity by the Clough Center for the Study of Constitutional Democracy, directed by Professor Vlad Perju of Boston College Law School. We also benefited from our partnership with the Research Group on Constitution-Making and Constitutional Change in the International Association of Constitutional Law. We thank both for supporting our Workshop. One of the wonderful things about this volume is that it springs from the ideas generated by many scholars in the increasingly popular study of constitutional amendment, including most notably Mark Tushnet. During the conference that led to the production of this volume, he offered productive, challenging and really quite useful comments on the papers. His scholarship on constitutional change and interpretation, on the judicial role, and more recently on constituent power has informed virtually all of the papers in the volume. We were also fortunate to have with us James Fleming, a leading thinker on constitutional morality, and Bjørn Erik Rasch, a political scientist whose work is indispensable to legal scholars in search of a full-bodied understanding of constitutional amendment. It is the nature of edited volumes that deadlines must be met in order for the book to be published on time. Thankfully, our group of contributors were on time, and this allowed us to meet our publishing deadlines—something we were not sure we would be able to do! This book aspires to be the first to address comprehensively the new dimensions of the study of constitutional amendment, and to become a reference point for all scholars working on the subject. The volume covers all of the topics where innovative work is being done, such as the notion of the people, the trend of empirical quantitative approaches to constitutional change, unamendability, sunrise clauses, constitutional referenda, the conventional divide between constituent and constituted powers, among other important subjects. It creates a dialogue that cuts through these innovative conceptualisations and highlights scholarly disagreement and, in so doing, puts ideas to the test. The volume therefore captures the fierce ongoing debates on the relevant topics, it reveals the current trends and contested issues, and it offers a variety of arguments elaborated by prominent experts in the field. It will, we hope, open the way for further dialogue. We expect this volume to become a reference book on imposed constitutionalism. It will provide indispensable material to scholars and students who work on comparative constitutional law, public law more broadly, as well as to political scientists who focus on constitution-making and constitutional change. The volume will also address some of the most important issues discussed in contemporary constitutional law: the relationship between constituent and constituted power, the source of constitutional legitimacy, the challenge of foreign and expert intervention in constitution-making, and the role of comparative constitutional studies in constitution-making.